Bil Simser over at the Fear and Loathing blog has put together a very good tutorial on how to use Subversion properly, including branching and revisions. He has pictures, and goes very very slowly which is helpful for “one repository, one code base” people like myself. It’s crystal clear, and if you use Subversion, will actually make it easier for you to use. By admin on May 30, 2008 | Code, Development | A comment? The cause of the problem is stupid stupid stupid. You can bang your head against the keyboard, there’s no way you could have known. This post, meanders a bit, so if you want the solution, jump to the bottom. the list is scoped at the root web of the site collection. Which is silly, because once we come to the cause, the error is completely within the realms of detection. To the developer who wrote that line of code… 10 minutes on the naughty step. The problem is seemingly unresolveable. If you try to add the dataview directly to a page in a subsite, it works fine, but master page? Sharepoint tells you to go whistle. The cause? Sharepoint doesn’t know which “web” the list comes from. The Dataview web part can take parameters, including, parameters which tell pages where to find a list. In Sharepoint Designer, when you edit a master page, it fails to insert a parameter telling pages the list lives in the root. The problem compounded because taking a dataview created on a subsite and dumping the code into the masterpage doesn’t work either (which makes it very tricky to solve). 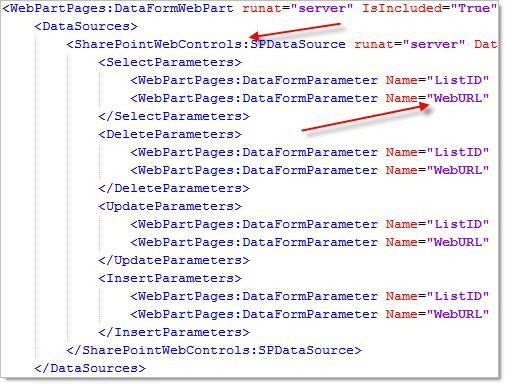 First, the datasource control (a child of the dataview web part) is referred to with a different namespace in the master page than in the page itself. This is why you can’t copy dataview code from a regular page into a master page. Maybe there’s a good reason for having done this, but I think the masterpage programmer forgot to speak to the regular page programmer. However, that isn’t the root cause, but something to be aware of. Second, THERE’S ANOTHER PARAMETER. OMG!!! Froth, swear, stomp, swear, slam your keyboard. Feel better? Knowing a parameter exists and knowing the syntax are two different things. Before finding the actual code, I was pretty confident the problem was down to subsites not knowing where the list was. The worst thing is that the url of the web is actually part of the dataview web part, down at the very bottom of the code. Why doesn’t this flow through to the datasource? Naughty step! It’s simple enough to copy the parameter from the subsite dataview into the masterpage dataview. I don’t believe the approach is necessary if you’re referring to a list in a subsite (the parameter should be inserted automatically). The guy over at thekid.me.uk has posted a v. handy little note about how to get your a servers control into the toolbox in Sharepoint Designer. 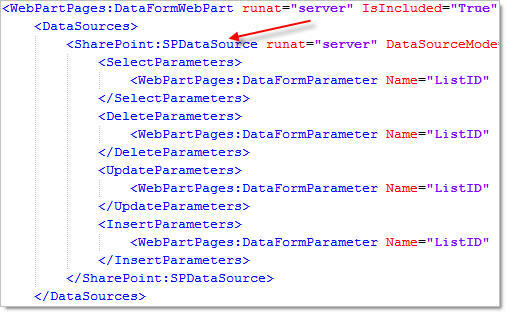 <prefix:ControlName runat=server /> into the page. By admin on April 28, 2008 | c#, Development, Sharepoint | A comment? Why does everything Sharepoint require a trip to Google? Oh well. If you’re trying to make a web part property editable you need two attributes, Personalizable and WebBrowsable. You need the WebBrowsable property in order to see the property via the web interface in Sharepoint. You need the Personalizable propetry to be able to edit it. However, Personalizable sounds like it’s tied to an individual user (and not all users). Like many things Sharepoint it depends. I’m not sure which is default, but according to this it’s the User Scope. Read the msdn article for a more detailed breakdown. Credit goes to Marco Bellinaso, as I found the reference to the PersonalizationScope on his blog. By admin on April 27, 2008 | c#, Development, Sharepoint | A comment? So, to create simple relative urls from code (as opposed to using the <% $SPURL:~sitecollection/_layouts/styles/myPart/myCss.css %> approach) I used something I found on Ari Bakker’s website. Deep underneath the SPContext object is a property called ServerRelativeUrl which is attached to the Site(SPWeb) and Site collection(SPSite) objects. By admin on April 21, 2008 | ASP.NET, c#, Code, Development, Sharepoint | A comment? One thing that’s is evident is that Intellisense is vital to being productive. It’s just far too slow to develop without it. So when Intellisense died in VS2005, I got grumpy. It wasn’t totally dead, just mostly dead. It would still give me references to strings and stuff, but the entire Microsoft.Sharepoint library was Intellisense free. I eventually found a solution on my own, although I won’t claim to understand it. in the 12 Hive there’s a file called Microsoft.Sharepoint.xml, which seems to contain the Intellisense definitions. All you need to do is “touch” it (i.e. change the file modification date), restart Visual Studio, and Intellisense springs back to life. The file is under the ISAPI folder. Take a backup obviously. I did try two other things which may or may not have helped. which is apparently the Intellisense cache. I did this before playing with Microsoft.Sharepoint.xml, but only had a little joy (a few more things came back but nothing in Microsoft.Sharepoint). I also removed the Microsoft.Sharepoint.dll and added it back in, but can’t tell if it helped or not. By admin on April 16, 2008 | c#, Development, Sharepoint | A comment?